On its Nintendo.com page, A Gummy's Life sells itself as "a game in which the winner is the one who enjoys the most." This is a sweet sentiment, especially in a world of cutthroat competitive experiences, but it points to a fundamental, unfortunate truth of the party game: it's more entertaining the less invested you are in who wins and who loses. In fact, due to some sloppy physics-based controls and erratic gameplay, A Gummy's Life is probably better as a spectator sport. In A Gummy's Life, just as in Human: Fall Flat, all the playable gummies wobble around with a solid midsection and dangling limbs. The left stick controls movement, while B hops, A kicks, X lifts, and Y headbutts. The trigger buttons punch left and right; if they're held down, your gummy will grab instead of punch. However, where Human: Fall Flat is a slow, methodical puzzle game, A Gummy's Life is a fast-paced brawler, an offshoot of games like Super Smash Bros. and Power Stone. It needs quick, decisive, predictable inputs and reactions. Unfortunately, the game's controls — and by extension its combat — are as squishy as their namesake. So many of the interesting mechanics, stage layouts, and multiplayer modes in A Gummy's Life are wasted on its unsatisfying, flailing combat. Gummy characters sway and waddle, attacks lack impact and land only sporadically, and there are constant bunch-ups (not unlike a group of gummies stuck together at the bottom of the bag). If you live for random combat, and the unpredictable, comical scenarios thereof, then you might be more forgiving of these random physics. If you enjoy tactical — or at least calculable — fighting, though, you'll find yourself bored after only a few sessions. It's a shame, because developer EP Games has surrounded the iffy controls and combat with some rather impressive maps, modes, and options. The game's 15 maps are the highlight. Each plays differently from the next, thanks to a unique gimmick and layout. Powxels is a Minecraft-esque layout with a dozen-plus cannons firing continuously; Zombarn is a large, open-air environment that slowly fills with zombified gummies; The Rolling, inspired by Raiders of the Lost Ark or maybe The Fellowship of the Ring, sends huge boulders down a stone staircase; and A Frog's Life is essentially one huge level of Frogger. These and others are available across four game modes: free-for-all, team deathmatch, king of the hill (playable in only eight of the fifteen), and hot potato. 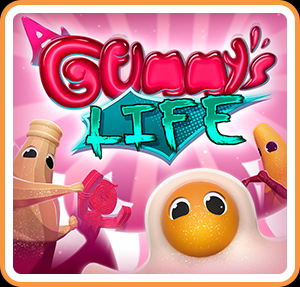 In addition to a host of maps, A Gummy's Life offers up 13 playable gummies, with four more to be unlocked. There's a banana, a bottle, a teddy bear, a watermelon slice, a Twizzler, etc. Each has its own stat line, so you can attempt to play strategically. These maps and characters are all available solo versus bots, but it's against other humans that A Gummy's Life is meant to be played. Up to eight players can wriggle and flap about online or locally — a generous number, for sure. While playing by yourself isn't especially interesting or rewarding, with a group of friends the game becomes more palatable, but only in small doses and, again, only when treated as a lark. The good news: online matchmaking, with strangers or buddies, is quick and easy. Aesthetically, A Gummy's Life is a bit of a drag. Its barebones menus, simple geometry, and low-res assets grant it a cheap appearance. Its eclectic soundtrack performs better, thanks to some catchy and thematically diverse tunes. The melancholy western drawl of Zombarn is particularly good. A Gummy's Life features some interesting stage gimmicks, a bunch of wacky gummy characters, and eight-player multiplayer, but wastes them on spongy controls and unpredictable, unrewarding physics-based combat. The winner is the one who enjoys the most, but that person is likely to be an onlooker chuckling at the randomness on screen. This review is based on a digital copy of A Gummy's Life for the NS, provided by the publisher.